Windows 10, 8.x all versions, Windows 7 all versions, Windows Vista, Windows XP, or Windows NT, and a laser printer with at least 600 dpi resolution fitted with MICR toner Magnetic Ink). Typesetting equipments are also supported, as long as Magnetic ink is used for the MICR strips. MICR E13B characters must have very precise dimensions, to generate reliable signal when going through the readers. Many MICR fonts around do not meet these standards, and not all MICR fonts are created equal. Some have positioning inaccuracies that create unreliable MICR strips, and may generate errors in the bank processing equipment, leading to manual processing fees. The MICR E13B Match™ font set has been created with extremely accurate positioning, and tested with the finest benchmark systems. Under ideal conditions, there should be only one font in use, the MICR E13B Match. It has been created specifically to meet the ANSI and ABA (X9, 27-1995) banking standards when printed at exactly point size 12. Unfortunately, the PC printing chain is such, that several weak links can hinder results. Even the most precise of font data is translated at least twice along the printed chain : first, by the Windows printer driver, which converts the font outlines into data instructions (PostScript or PCL) usable by the printer, and secondly, by the printer internal logic circuits, which translate the outlines in data that will drive the actual printing hardware. Even at that last stage, outlines are not printed as simple lines, but as a very fine matrix of dots, by a laser beam, LED, or another technology. So a full set of fonts is provided, with dimensions 1% apart from each other. Two smaller sizes (MICRE13 M1 and MICRE13 M2) provide 1% and 2% smaller printing, respectively. Two bigger sizes (MICRE13 P1 and MICRE13 P2) provide 1% and 2% larger printing, respectively. 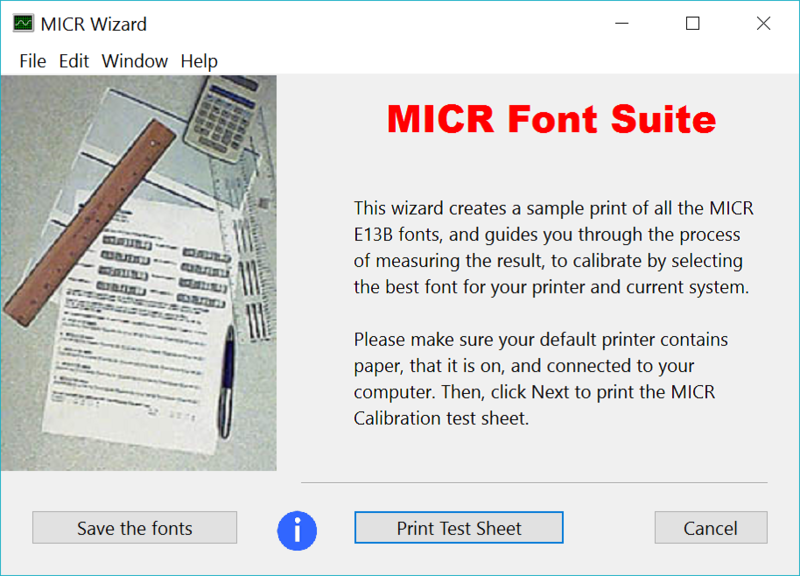 The MICR Calibration Wizard™ will let you easily choose the best font for your entire printing chain, hardware and software. On top of these, the pack contains bolder and lighter fonts, to accomodate different processes. For instance, typeset tends to print lighter, and you may need to compensate. The bolder the font, the higher the signal. In total 15 fonts will enable you to get the very best results from your system. The MICR E13B Match™ font set is the only one that comes with the exclusive new MICR E13B Calibration Wizard™. Within minutes, using this astute calibration tool for all versions of Windows, from 3.1 up to the latest Window 8.x, you will be able to generate accurate and reliable MICR strips. Simply launch the MICR Calibration Wizard™ from the Start menu, and follow the simple instructions on the screen. When finished, the program will give you the exact name of the font that must be used to obtain optimum results. Changes in the hardware (printer, controller) and software (Windows version, driver) configuration may modify the MICR printing. With the MICR Calibration Wizard™, you will be able to recalibrate your system anytime you upgrade. In a few minutes, the MICR Calibration Wizard™ will give you the exact MICR font to use amongst the 15 fonts supplied in the pack. As you can see on these enlarged samples, the fine line printing is not using straight lines (fairly easy to modify), but waves of parallel curves. These three examples also show the value microprinting underneath every number. Please note the "superscript zero", convenient to produce "zero cents", another exclusivity in this pack. The "subscript zero" is also available". 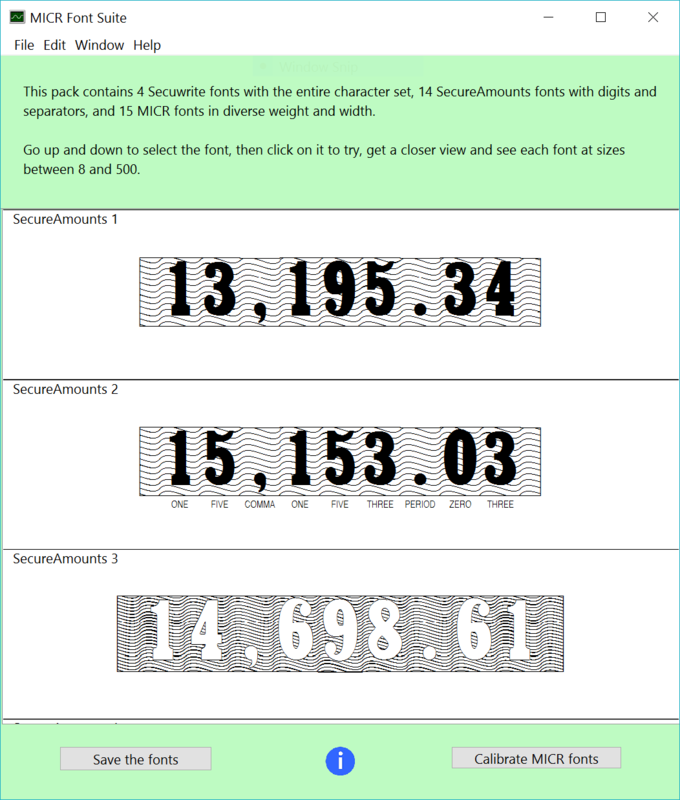 Straight lines background fonts are provided too, for systems that may not be able to render well the fine line and microprinting of fonts 1-6, for a total of 14 SecureAmounts™ fonts ! Click below to see the full range of fonts. To get a quote on larger licenses, please click here . All larger site licenses are custom orders, digitally signed and built for your company.